In today’s reputation economy, people are typically skeptical of traditional marketing and are now turning to the internet to research service providers and products. Personal stories from past clients are far more effective than you touting how great your product or service is. People relate to what others have experienced. … and of those consumers, 85% wanted to warn others about doing business with the company. 86% of consumers are willing to pay up to 25% more for a better customer experience. The answer to that question is based on a 0-10 scale and correlates to your Net Promoter Score. The NPS is an index that ranges from -100 to 100. It measures the willingness of customers to recommend a company’s products or services to someone. It is used to gauge a customer’s overall satisfaction with a company’s product or service and the customer’s loyalty to the brand. 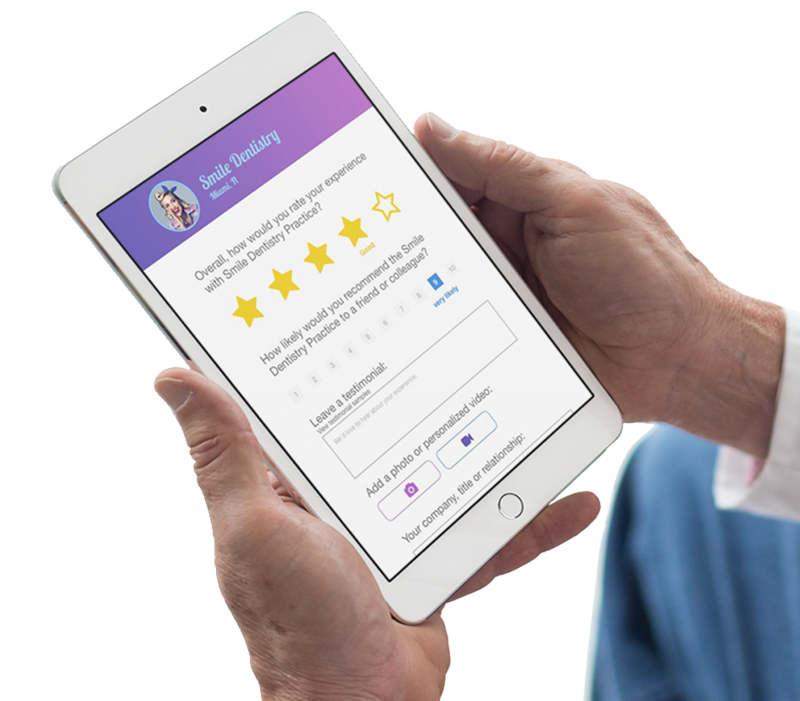 Testimonial Tree includes the Net Promoter Score scale on customer satisfaction surveys to help you benchmark against your industry standards. We’ll display the NPS in your dashboard so you always know where you stand. of people trust online reviews as much as a personal recommendation. That means a complete stranger’s opinion posted online has almost the same impact as a friend’s recommendation. Step away from the clipboard and put an end to manually uploading survey results! Testimonial Tree’s survey software automatically sends out a feedback request email or text message to your clients. Our team will help you put together the most effective survey whether your goal is a high Net Promoter Score (NPS) or adding points towards your MIPS reimbursement. Physicians are advised to regularly assess the patient experience of care through surveys. This medium weighted sub-category (Beneficiary Engagement) adds towards your Quality score which accounts for 60% of the total MIPS performance score. Testimonial Tree’s Patient Satisfaction Surveys are easy to set up and can make a big difference in your total revenues. Our surveys can help your practice receive a Medicare reimbursement of 4% or higher. Jason is the man! Real Estate Agents have all agreed that they benefit from Testimonial Tree's services. Nothing is more important than reputation in a legacy real estate market like SWFL and Jason's resources help!